The global digital population has exploded in the last decade and now totals a staggering 4.2 billion people. That means, if you’re considering building a blog, you have 4.2 billion opportunities to get new fans and make some serious money. As is the case with anything worth doing however, building a blog takes time. The first step you’ll need to tackle when creating yours is picking the right blog hosting platform. For the uninitiated, a blog hosting platform is the engine that runs your blog. It’s where you’ll write your content, engage with your followers, and do just about everything else. Picking the right platform can make your blogging experience significantly easier. Picking the wrong one… well… doing that is a recipe for giving up. To help you find the right blog hosting platform, below, our team shares our top 10 recommendations. WordPress powers 30% of the entire internet! That makes it the most common blog/website hosting platform on the face of the planet. It’s no wonder why people love WordPress either, the platform works like a dream! WordPress is intuitive and given the amount of support it gets from its parent company and the rest of the internet, you can do just about anything you want with your WordPress blog through the power of millions of online templates and plugins. To top it all off, WordPress’ core is 100% free. Joomla! is an incredible blog hosting platform that’s very similar to WordPress. While not as popular or as widely supported, Joomla!’s core offers more flexibility than WordPress out of the box which may give it an edge for slightly more tech-savvy users. Furthermore, Joomla! is 100% not-for-profit. If that means anything to you from a moral standpoint, you may want to try your hand at Joomla! Drupal is yet another platform that, in spirit, shares a lot of similarities to WordPress and Joomla!. The big difference with Drupal is that it’s pretty hard to use. Drupal is definitely a “some coding knowledge required” platform but with that requirement, the platform is one of the most flexible website and blog hosting platforms on the market. Ghost is a streamlined blog hosting platform that beginners and experienced bloggers alike love. Ghost’s easy to use blog-focused interface makes it easy to pick up when it comes to first-time bloggers. That same interface is loved by seasoned bloggers because it makes creating posts on a regular basis just about as simple as publishing content can get. While more of a website building platform than a traditional blog platform, many people opt to create their blogs on WIX because its website builder is so darn simple to use. WIX is pretty much the pioneer of creating stunning websites with a drag and drop editor. All of its site templates are 100% mobile-friendly and pricing for this platform is pretty reasonable. While we love WIX for its ease, we do question how scalable a blog can be using it. Another blog hosting/website building platform that’s similar to WIX is SquareSpace. SquareSpace’s outstanding interface makes the platform easy to use and it’s great selection of eCommerce tools makes selling things through your blog simple. Again, this platform isn’t traditionally targeted at blog building but certainly can be used to create stunning blogs. Given its pricing plans, you’ll probably need to explore eCommerce to some degree to justify your using the platform. If you’re looking for a more bare-bones and consequently easier to use blog hosting experience that’s similar to WIX and SquareSpace, try Weebly. Weebly features an excellent drag and drop editor for building your blog and a few easy to use eCommerce integrations in case you’re looking to sell merchandise. Weebly does not have much in the way of HTML, CSS, and JScript customization options. If you’re a tinkerer you’ll want to steer clear. No blog hosting platform is complete without a mention of Blogger. Blogger was the original blog platform and was built on the principle of providing people with the tools they need to share their rants and do… well that’s about it. Blogger is free and even if you’ve never seen a computer before you’d be able to figure out publishing content in about 15 minutes. You’re not going to be able to scale your business around blogger very well but if you’re looking to blog just to blog, there’s no simpler way to do it. For casual bloggers, Tumblr is great. Its beautiful interface and fun community make sharing your thoughts on the platform easy and fun. In recent years though, Tumblr has put less of an emphasis on writing and more of an emphasis on pictures/gifs. Because of that, if you’re looking to share a lot of written content, this may not be the platform for you. Yep. But we didn’t mention WordPress.com. WordPress is the free-to-use, self-hosted version of the WordPress core. WordPress.com is hosted by WordPress, streamlines things a little, and costs money. We figured we’d give this version of WordPress shout out on our list for those of you that want to use WordPress but don’t want to go through the trouble of setting up your hosting platform by yourself. There you have it. 10 killer blog hosting platforms for every skill level. Once you’ve got your blog up and running, the next key to gaining a massive audience is to create a lot of content, fast. If you need expert help creating content that will rank high in search engines, our team can help. 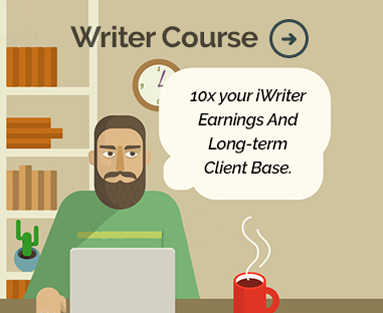 At iWriter, we create expertly crafted content at incredibly low prices with a 100% guarantee. Learn more about the content we create and start dominating the blog-o-sphere today!